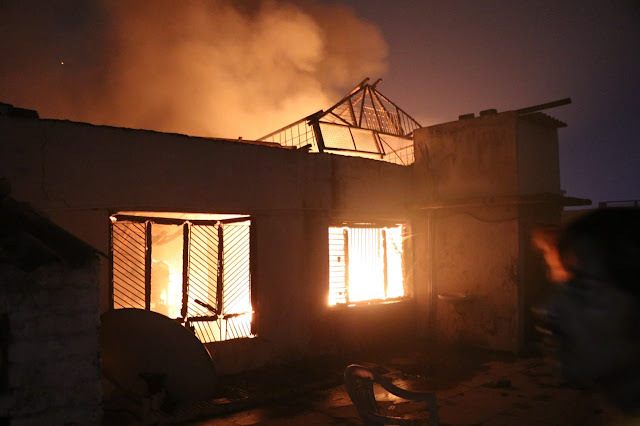 The celebration of Dipawali was going on; the crackers were in the sky, but one of them barged into a home situated in Birhana under Naka Thana Lucknow on Wednesday late evening. The house caught fire which turned into ashes. A wax piled home in narrow lane where candles makers were in rest inside stunned when the fire suddenly flared; and they came out of the building. The building had had lodged more than 12 liquidated propane gas cylinders which were fuelling the engulfed fire in the building. The building were in use of candle makers, and huge wax were piled in the wake of Dipawali which is a festival of light and traditionally candles are used by people for lighting their homes. According to report, a hot air parachute balloon which were flown in the air fell on the house was burning and set this house on fire. The fire was intense and the firemen were trying to extinguish it, but the fire caught into the wax; the gasoline cylinders fuelled it. The fire Brigade vehicles reached the spot, but the firemen faced difficulties to control it because the lane which goes to this place is narrow where the heavy vehicles cannot make its access. No casualties has been reported, but the house and adjoining families other houses were evacuated; till Thursday morning they were not allowed to return. The damage has not been yet assessed. The factory was in residential area that has ruined now, which has no license, so the owner and the tenants have been arrested.